nk you to Holland House Cooking Wines for sponsoring this Stuffed Chicken Marsala Recipe. While I was compensated for this post, all opinions are 100% my own. This delicious Stuffed Chicken Marsala recipe is made with baked chicken breasts stuffed with Italian cheese, sun-dried tomatoes, basil, and green onions, and covered in a creamy Marsala Cooking Wine sauce. This Stuffed Chicken Marsala makes a delicious gourmet dinner for a small holiday gathering or as an alternative traditional turkey or ham dish. A variation of the very popular traditional Italian Chicken Marsala, this Stuffed Chicken Marsala dresses up and glamorizes the classic chicken marsala. It is like the recipe got all dressed up to be ready for the upcoming holiday parties. And what will the best-dressed chicken marsala be wearing for the holidays? 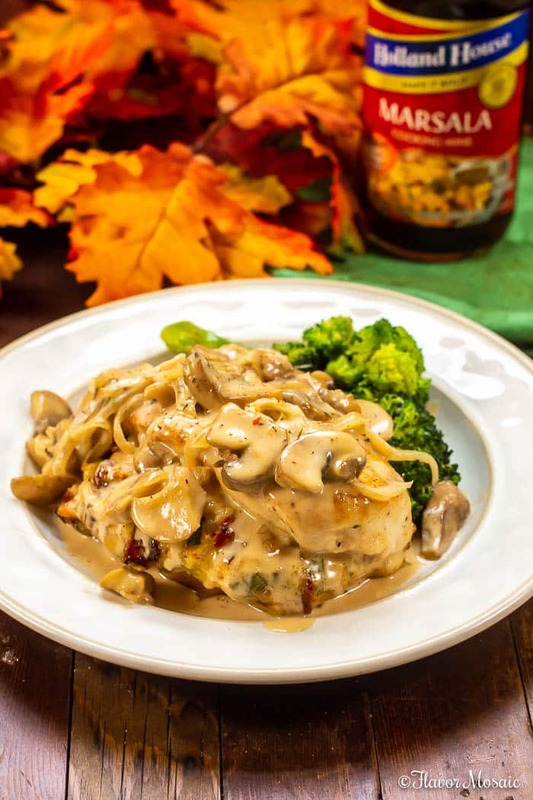 Why a creamy Marsala Cooking Wine Sauce, of course! Only the best will do for this dish. 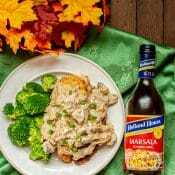 That is why Holland House® Marsala Cooking Wine is the featured ingredient of this creamy sauce. 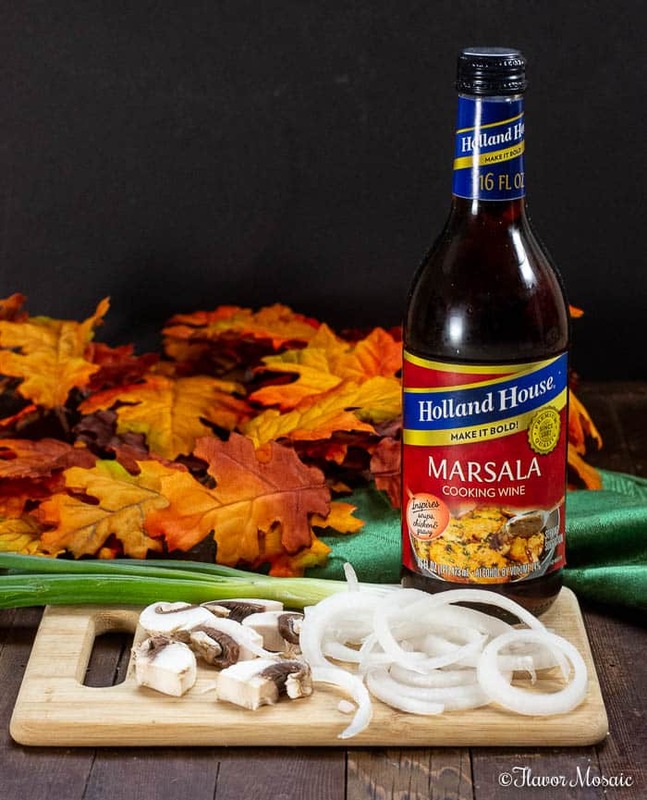 With its golden color and wonderful aroma, Holland House® Marsala Cooking Wine has a smooth, well-rounded, sweet-wine flavor with hints of hazelnut that is ideal for cooking! The holiday season calls for comfort food and entertaining. Holland House’s BOLD boost of flavor elevates any dish whether it’s chicken for a weeknight supper, a family dinner or a zesty, gourmet chili to serve a crowd. Holland House® Cooking Wines are also a fantastic way to add bold flavors to classic dishes, as well as holiday dishes. 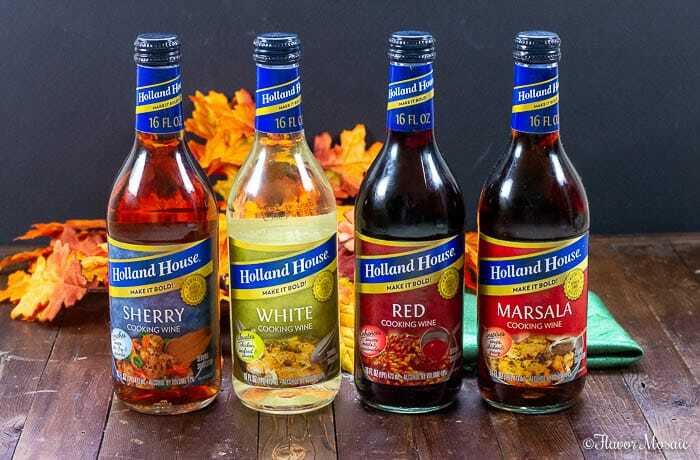 In addition to their Marsala Cooking Wine, Holland House® offers a variety of cooking wines, including Sherry, White, White With Lemon, and Red Cooking Wine. Be sure to follow Holland House on Facebook and Pinterest for more delicious recipes and tips! Don’t be intimated by this impressive, gourmet Stuffed Chicken Marsala. I’ll take you through step by step to show you how to make it. Italian style shredded cheese – I used a blend that consisted of provolone, mozzarella, and parmesan. However, you could use only Mozzarella or any blend of Italian cheeses. Italian Style Bread Crumbs – you could use regular breadcrumbs or panko breadcrumbs. I like the Italian Style Bread Crumbs and then I add additional Italian seasoning for even more flavor. Minced Garlic – fresh garlic tastes fantastic in this dish. If you are out of fresh garlic and don’t want to run to the store, you can use garlic powder. But if you are planning this recipe in advance, get the fresh garlic. Crushed red pepper – For a little bit of heat, add some crushed red pepper. Of course, this is completely personal preference. So don’t worry if you don’t want a spicy dish, just leave the crushed red pepper out. Sun-dried tomatoes – add a ton of flavor to this Cheese Stuffing. Do not leave these out! If your sun-dried tomatoes come in oil, be sure to drain the oil and chop the sun-dried tomatoes. Green onions – Chop up some green onions for some delicious flavor and color. Fresh basil or Italian parsley – I love adding chopped basil because of both the flavor and aroma. However, you could also chop up some Italian parsley as well. It is whatever you prefer. Sour cream – The sour cream binds the stuffing all together and gives it a great texture. Italian Seasoning – I add additional Italian Seasoning to add herbs and spices for even more flavor. Butter – makes everything better. Onion – use a small white onion and thinly slice. A yellow, sweet or Vidalia onion would work as well. Mushrooms – You can use crimini, porcini, or any type of mushroom you like. 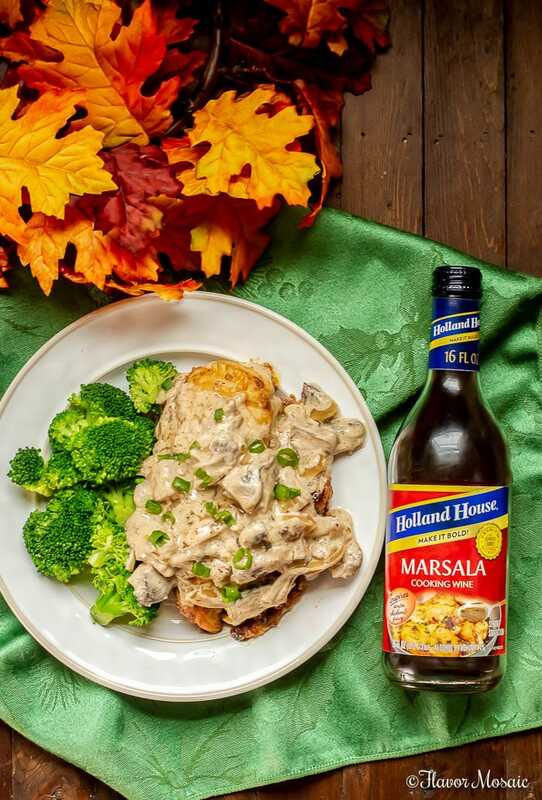 Holland House® Marsala Cooking Wine – This Stuffed Chicken Marsala would not have its name without Marsala wine, and I recommend Holland House® Cooking Wine for this delicious sauce. Heavy cream – This makes the sauce creamy. 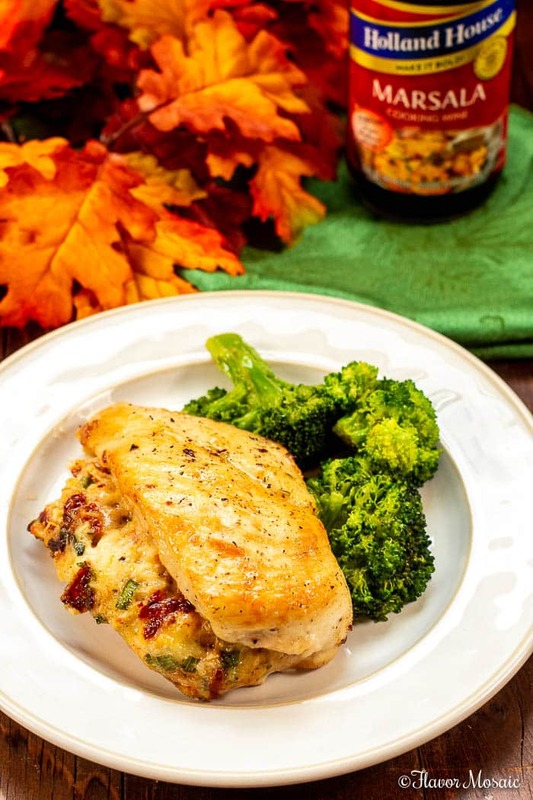 Boneless, skinless chicken breasts – Slice the chicken breasts in half, slicing horizontally to create a pocket so that it can be filled with stuffing. Olive oil – you could use coconut or avocado oil as well. All-purpose flour – This is used for dredging the chicken before browning the chicken breast in the skillet before baking in the oven. In a large bowl, stir together all the ingredients above for the stuffing. Slice the chicken breast in half horizontally to make a pocket in the chicken breast. Stuff the stuffing inside the chicken breast. Add oil or butter to a skillet. After the butter is melted, add onions and cook until the onions are clear or translucent. Add mushrooms and cook until the mushrooms are tender. Pour in the Holland House® Marsala Cooking Wine and let it simmer. Pour in the heavy cream and reduce by half. 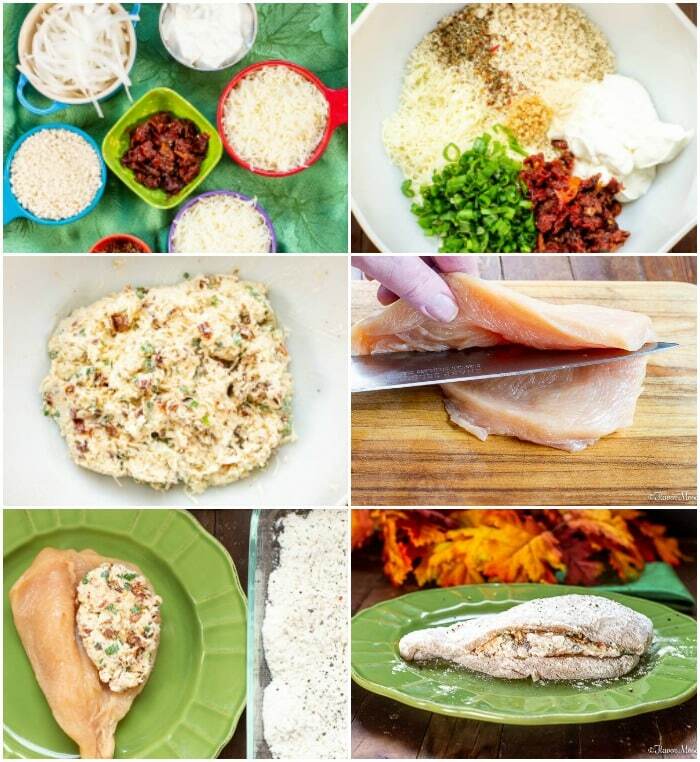 Place the stuffed Chicken Breasts in a baking dish. Bake in a 350-degree oven for about 20 minutes. Remove the chicken from the oven when done. Pour the onions, mushrooms and Marsala Sauce over the top of the chicken. Serve with Mashed potatoes, pasta, roasted brussels sprouts, or a salad. Serve Stuffed Chicken Marsala for a date night dinner, a small holiday dinner party, for a holiday dinner. It is gourmet, and impressive for the dressiest occasions but easy enough to make any time. Find more elevated bold recipes and quick tips on Holland House’s website – like replacing 1/3 cup of water with Holland House White Cooking Wine when boiling rice to create an incredible flavor. Or, add a boost to roasts and other beef and pork favorites – to impart a flavor. Pre-heat oven to 350°F. Spray a baking dish with cooking spray. In a large bowl, add all Cheese stuffing ingredients and stir until well combined. Set aside. On the side of a chicken breast cut a slit to create a "pocket." Do not slice all the way through. Stuff each chicken breast with 1/4 of the cheese stuffing. You do not need to seal the chicken. In a large skillet, heat oil until it shimmers. While the oil heats, place flour, salt, pepper, and garlic powder in a shallow dish. Press each side of the stuffed chicken breasts in flour, shaking off excess. Remove the stuffed chicken breasts from pan and place in a baking dish. Bake the stuffed chicken breasts for about 20 minutes, or until juices run clean and the temperature of the center of chicken reaches 165°F. Add butter to the same pan that you cooked the chicken. Add onions and cook for about 2 minutes. Add mushrooms and cook for about 5 minutes or until the onions are translucent. 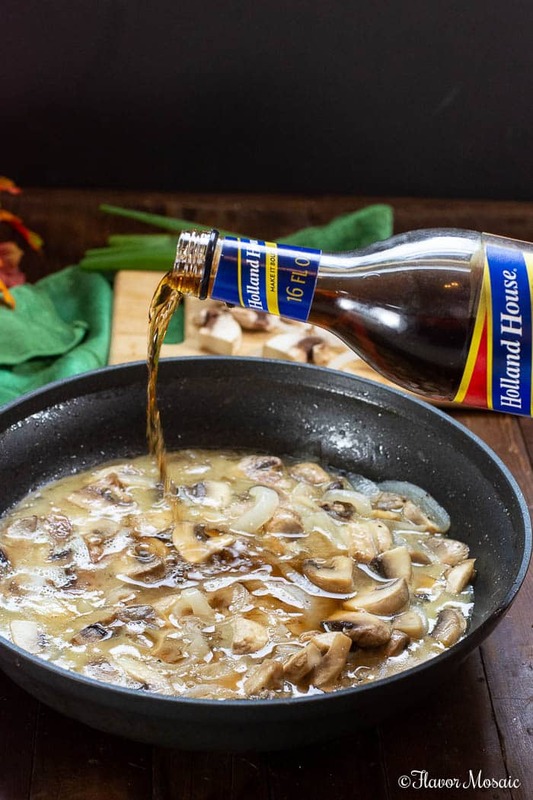 Add the Holland House® Marsala Cooking Wine to the pan and simmer on low heat. Add the heavy cream and cook until the sauce reduces by half. 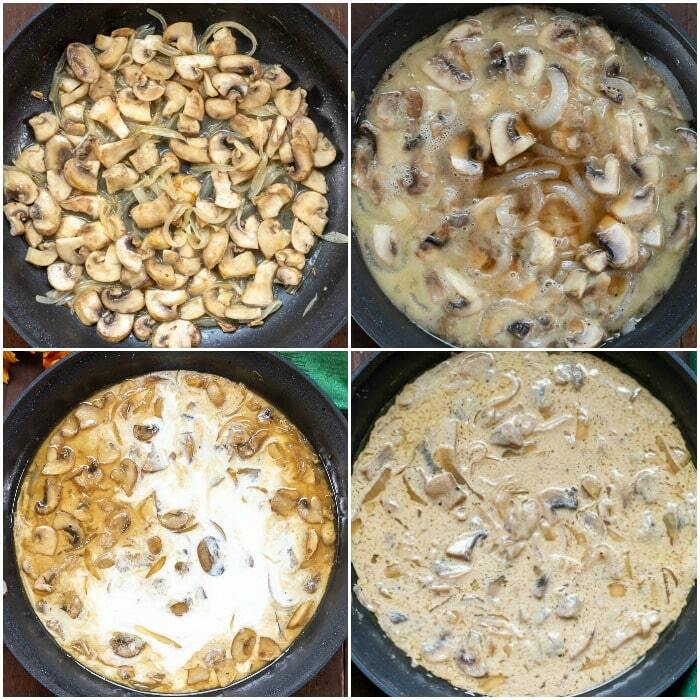 Place the cooked stuffed chicken breasts on a serving dish and top each with the cooked onions, mushrooms, and Marsala sauce.